A classic 9ct white gold Spiga bracelet. 7.5"
Classic jewellery for any occasion. 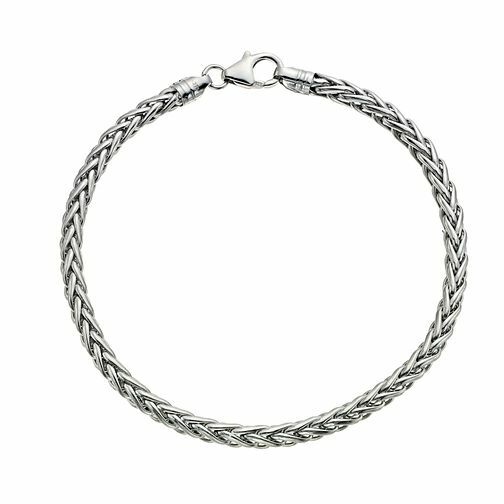 9ct white gold spiga bracelet is rated 3.6 out of 5 by 5. Rated 1 out of 5 by Anonymous from Oh dear I love white gold jewellery and my husband bought me this bracelet about 18 months ago. I love the spiga look so loved this. Unfortunately at Chrismas one of the links broke I took it to a jewlers who charged £15 to repair the link which I had done. Since getting it repaired another link has broken. I bought this item on sale at £100 do not buy this at £299 it is not worth the money it is not worth me getting the repaired again at the rate it is breaking such a shame as I expect gold jewellery to last a bit longer than this.